In this Photoshop Effects tutorial, we'll learn how to add some action and a sense of motion to a photo with a zoom blur effect. We'll use Photoshop's Radial Blur filter to add the initial blurring, then we'll bring back some of the original image using a layer mask and the Gradient Tool. Not only is this a great (and popular) way to help bring an image to life, but the entire effect can be completed in less than five minutes once you're comfortable with the steps. Note: This version of the tutorial is for Photoshop CS5 and earlier. 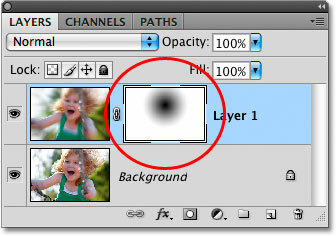 Photoshop CS6 and CC (Creative Cloud) users will want to check out the fully updated Radial Blur Action Effect tutorial. The final "action zoom" effect. 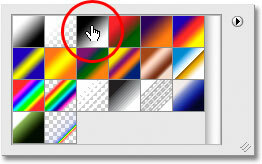 The original image appears on the Background layer in the Layers panel. An exact copy of the image now appears on "Layer 1" above the Background layer. This brings up Photoshop's Radial Blur dialog box. The Radial Blur filter gives us a choice of two different types of blurring - Spin and Zoom. Since we're creating a zoom effect, set the Blur Method option on the left side of the dialog box to Zoom. Directly below the Blur Method option is the Quality option. Choose Best for the quality. We control how much blurring is applied to the image with the Amount option at the top of the dialog box. The higher the Amount value we select, the more blurring is applied. Drag the slider towards the right to increase the Amount value, or drag it towards the left to decrease it. Unfortunately, the Radial Blur filter doesn't give us a preview of the effect, so you'll probably need to try a few different values before you find the one that works best for your image. I'll explain how to do that in a moment. I'm going to set my Amount value to 50, but the value you end up choosing may be different. Finally, use the Blur Center box on the right side of the Radial Blur dialog box to set the point where the blur will appear to be "zooming" out from. Simply click inside the box to set the point. Again, there's no way to preview the effect before running the filter so be prepared to try a few times before you get it right. I want my blur effect to appear to be coming from behind the girl's head, so I'm going to click above and to the right of center in the box to set my point. Set the blur type, quality, amount and "zoom point". 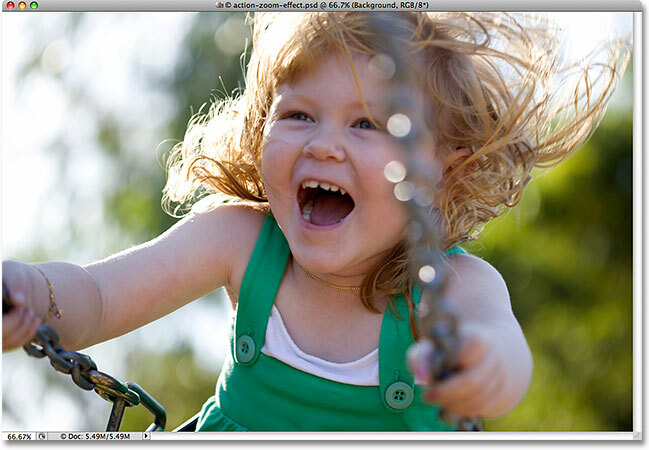 Undo the blur effect with Edit > Undo Radial Blur, or press Ctrl+Z (Win) / Command+Z (Mac). The highlight border around the layer mask thumbnail tells us that the mask, not the layer, is selected. Click anywhere outside of the Gradient Picker to close out of it when you're done. Drag out a Radial Gradient across the area where you want to hide the blur effect and reveal the original photo underneath. Drawing the gradient on the layer mask reveals part of the original image underneath. If you're not happy with your initial gradient, simply press Ctrl+Z (Win) / Command+Z (Mac) to undo the gradient, then try again. 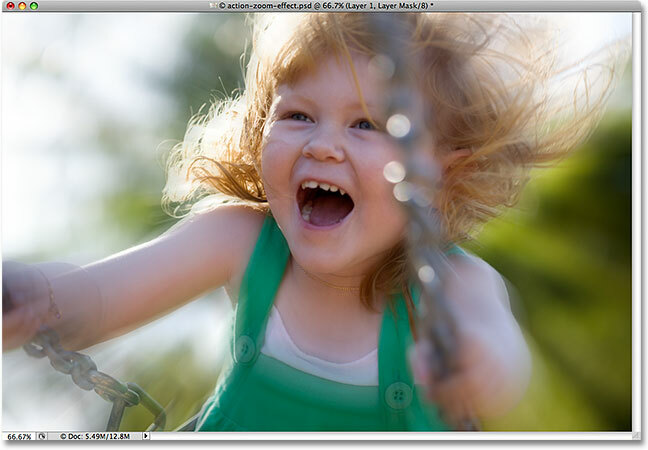 Lower the opacity of "Layer 1" to reduce the intensity of the blur. And there we have it! That's how to add action and motion to an image with a zoom blur effect in Photoshop! Visit our Photo Effects section for more Photoshop effects tutorials!